The men's 100 metres final has come and gone at the World Athletics Championships, and as you can see in the photo above, Usain Bolt isn't the one who's celebrating. So what happened? Ever since his remarkable showing at the Beijing Olympics in 2008, Bolt has been the sprint king. Whether the 100 metres or 200 metres, the Jamaican has wiped the floor with his competition and raised the bar of what people thought was possible in sprinting. Now Bolt hasn't had a particularly good build-up to these championships; he's missed Diamond League events with injury problems, and was beaten early in the season by the American, Tyson Gay - who seemed to be destined for a career as the perennial nearly man. But Gay was absent from these championships, and Bolt's countryman, Asafa Powell also missed out on running in Daegu, due to a groin problem. Powell has run the fastest 100 metre time of 2011 so far, but with him and Gay gone, it seemed that all potential roadblocks had been removed. The path was clear for Bolt to retain his world title, and thrill the South Korean crowd with another potentially supersonic and effervescent display. Watching Usain Bolt is an occasion in itself, and I made sure that I was awake on Sunday morning to watch him in action. Listening to the television commentary, they had already ordained Bolt as the winner. As far as they - and most of the press corps were concerned - the script has been written in advance. This was another chapter in the stellar career of Bolt. We had our king, let him go and claim his crown. One shouldn't be too harsh on the media for this prognostication. Bolt has redefined the boundaries of what is possible in track sprinting, and while some has questioned his state of readiness in the lead-up to the championships, those doubts seemed to be allayed in the qualification rounds as Bolt stormed through to the final with absolute ease. Not only was the man with the reputation, but - once again - he was the man in form. Off went Bolt. The only problem was that the gun hadn't. The Jamaican false-started. The rules on this are clear. One false-start and you are automatically disqualified. No-one knew this better than Bolt as he roared & tore off his vest in pure frustration, the defence of his world title over. The disbelief on Bolt's face was matched by the reaction of the crowd. Athletics' marquee name left the track in ignominy. Now many have said that this has shown the folly of the "one false-start and you're out rule". A year ago Tyson Gay said, "If Usain Bolt false started it would be a wake-up call. If it happened at the World Championships or Olympics, the result is going to need an asterisk by its side. Without him, it wouldn’t make sense." That may be so, but misses the point altogether. Rightly or wrongly, these are the rules that are in place. And it is a proviso that has existed in swimming for decades with negligible criticism from the punditocracy. The reason that this has now become a story is because it happened to Bolt, who had been hitherto untouchable. I once wrote on this blog that every now & then, sport produces a person who bestrides their event like a god, making it all the more implausible when they are shown to be a mere mortal. With Bolt gone, the race was down to seven mere mortals. The god was no more, leaving the field clear for an opportunist. And it was Bolt's fellow Jamaican, Yohan Blake who seized his opportunity. Blake is Bolt's friend and training partner, and has been dubbed by the Olympic Champion as, "the future". He is only 21, and is the youngest man to run the 100 metres in under 10 seconds. Blake showed on Sunday that not only has he the talent, but the strength of character to not be distracted by his friend's disqualification. Rather than live up to his moniker, Blake has arrived on the big stage. In the end, it was a comfortable win, as he ran the only sub-10 second time in the race. Bolt will be back to defend his title in the 200 metres, and in the post-race interviews Blake predicted that Bolt will be "angry", when he returns to the track in South Korea. We've seen Bolt beatific, but what will he be like enraged? Either way, it'll be must-see television. Part of me thinks that this makes the story of Bolt all the more compelling. Many find serial winners boring, but this adds a delicious layer of drama to the 100 meters at the Olympics next summer. We thought that London 2012 would be Bolt's coronation. Now it could be his redemption. 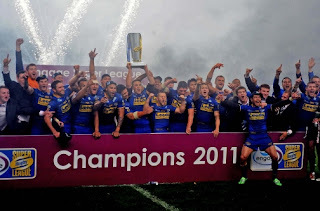 I must have re-written this blog post in my head about 4 times yesterday during Leeds Rhinos defeat to Wigan in the Challenge Cup Final at Wembley. After about 25 minutes this post was shaping up to be all about how Leeds had failed to turn up for the second year in a row, and were brushed aside in another embarrassing display as Wigan raced to a 16-0 lead. Leeds were making unforced errors, missing tackles, and failing to stop Wigan's offloads. We were lucky to be only 16-0 down, as a tide of Cherry & White shirts stormed forward, including a length of the field try involving the Tomkins' brothers. Leeds then began to play and grabbed 2 tries before the end of the half; all of a sudden I was starting to write something about restoring pride, going down fighting, and showing that we were not the whipping boys the press so desperately wanted us to be so they could write pieces about their "darling" Sam Tomkins. The first try of the second half was going to be all important and we got it. All of a sudden, something that seemed impossible just 20 minutes ago was looking possible; we could win this game, as we were just 2 points behind and clearly in charge of the game. Wigan were in shock, they were on the ropes. Fortunately for them the ref decided to give them a hand by making a string of errors that would ultimately decide the game. Now this brings us to the 3rd post I wrote, the one I wrote about 10 seconds after Ganson decided that Wigan had won the game by giving them the benefit of the doubt. That post would have been entitled, "Refs screw the Rhinos, the cheating BASTARDS!" Now let me briefly explain that the benefit of the doubt in any video ref decision in rugby league goes for the attacking team, which means if the video ref cannot decide if a player grounded the ball or not, he will award the try, which in itself is a highly flawed rule; that a game can be taken away from a team because a ref is unsure. So when this flashed up on the screen to give Wigan the game, it angered me, basically we had lost the game because a coward was unsure, and didn't want to make a call, despite the fact that the ball was in full view on the camera. I would have much more respect if he had just put try up on the screen, I would have felt robbed still, as it was clear to me - as a unbiased Leeds fan of course - that it wasn't a try. 1. At the end of the first half, he failed to sin-bin a Wigan player for a cheap high shot on Bishop, after he had chipped ahead. 2. More crucially, he missed a forward pass that led to Wigan's first try in the second half. This is a recurring nightmare for Leeds, as it was a try from a forward pass that had handed victory to Wigan at the DW stadium earlier in the season. 3. He somehow gave Wigan head and feed at the scrum that lead to Wigan's last try. The ball had clearly hit the Wigan player before going into touch. Bentham could have even gone to the screen to learn how to restart the game. Instead he happily handed Wigan the ball. This leads me to the last post, the one I'm writing now. The truth lies somewhere in between all of the above. Before the game we would have taken the final score, we had been told by everybody in the press that Wigan would win by at least 20 points. And after going 16-0 down, they were getting ready to write that story. Instead we got a great game of rugby, where the result was in doubt right till the last 3 minutes. We also got the rough end of all the key decisions by the ref but at the end of the day you cannot gift any team a 16-0 lead and expect to win. Sure we were robbed but ultimately not by the refs, but by ourselves. If we had played the full 80 minutes we would have won the game. If the ref had made the right calls, we might have won. That's the difference. "You Don't Know What I'm Capable Of"
I know a little bit about what she’s capable of. She’s been the head coach of the University of Tennessee’s Lady Vols since 1974. During this time, her coaching skills have brought UT 1,037 victories; her teams have only been defeated 196 times. She’s led the Lady Vols to the Final Four 18 times - more times than any other men’s or women’s college basketball coach — winning the championship 8 eight times. She coached the U.S. women’s basketball team to a gold medal in the 1984 Olympics, which was one notch better than the silver medal she won as a member of the team during the 1976 Olympics. Many of her girls have gone on to walk in her footsteps as coaches in their own right. Some have carried her lessons inside them through their own trips to Olympic victories. Some continue to wield the skills she helped them hone, onto WNBA courts across the country. More important than any of this, every one of the eligible athletes who played for her went on to graduate with a degree. She’s made certain of that. And these are just the “big” stats. There’s lots more to her beyond what I carry around in my weird noggin. I’m not much for sports or stats. But Pat Summitt has always amazed, inspired, and humbled me. She is a remarkable role model and, pardon my feminist streak for a moment, if she was a man in charge of a men’s college or NBA team, with the same set of stats that I just quoted, her name would be synonymous with the game itself, on the lips of every basketball fan from the Bay of Fundy to the Gulf of California. …and now she’s announced that she has the early stages of Alzheimer’s. She’s 59 years old. My heart hasn’t stopped breaking ever since I first heard this news. I hope Coach Summitt fights this with every ounce of the resolve that she carries in ample supply. I hope she never gives up. And I hope that every girl who has donned the orange of the Lady Vols, who has been pushed to their limits and beyond, who has been brought to tears and finally to triumph, and who has left the University of Tennessee that much more remarkable as an athlete and as a woman never forgets that it was Summitt’s fire that helped to forge them. The World Athletics Championships begin in South Korea tomorrow, but you'd be forgiven for having no idea about it. The London Olympics is drawing ever closer, and the hype has become a millstone around the neck of the World Championships. While the pinnacle of track & field is undoubtedly the Olympics, I look on with sadness at the decreased relevance of an event that at one stage was one of the biggest occasions in the sporting calendar. It's a meet where Mike Powell broke Bob Beamon's world record in the long jump, where Sergei Bubka won 6 gold medals in a row, and a place that bore witness to the incredible consistency of Merlene Ottey. The standard of competition was generally equivalent to the Olympics. Had it not been a biannual event, you could make a case for the World Championships being just as significant as its more celebrated sister. I have fond memories of being glued to the television as a 9 year old, watching the World Championships in Stuttgart, as Linford Christie, Sally Gunnell & Colin Jackson all won gold medals for Great Britain - Jackson setting a world record in the 110 metres hurdles that would last for 13 years. And it'd be remiss of me not to mention Jonathan Edwards taking the triple-jump to unfathomable heights in 1995, as well as Michael Johnson cementing his legacy as the greatest sprinter of his generation throughout the nineties and noughties (is "noughties" the correct term?). But the relationship between the championships and the Olympics is no longer symbiotic. As the Olympics bubble inflates, the world championships looks to be punctured. Yesterday, Asafa Powell pulled out of the 100 metres with injury, joining Tyson Gay on the sidelines. With Usain Bolt below-par and looking distinctly beatable this season, the blue riband event of the meet has lost much of its sheen. Teddy Tamgho is also absent with injury, depriving us of a potentially enthralling battle between him and Phillips Idowu in the triple-jump. While injuries are an unfortunate occurrence of the sport, you wonder how many absentees there would be if the Olympics weren't in a year's time. No-one wants to take the slightest risk of disrupting their preparations for London 2012, which has resulted in a distinct lack of star power in Daegu. It's understandable but also disheartening. The one potential silver lining - for British fans at least - is Mo Farah. The long distance runner has been a revelation this season. His showed his ever improving quality when he won both the 5,000 and 10,000 metres at last year's European Championships. He then took the bold career decision to leave London, and relocate his family to Oregen to train under Alberto Salazar. This change has only made Farah an exponentially better runner; he has stormed past all-comers this year. Farah is no longer just a European force in the long-distance events, but now a world one. In an event that has been a fiefdom for African runners for generations, he goes to the South Korea with a genuine chance of beating the great Ethiopian Kenenisa Bekele. It's not that there won't be some world class track & field on display, but the must-see factor that athletics had after the Beijing Olympics seems to be conspicuous by its absence. Hopefully, I'm mistaken, but the sport desperately needs a memorable meet to keep the World Championships relevant. Otherwise, they'll end up like the Pan-American Games or the European Championships, and those occasions have the increasingly enervating feel of a school sports-day. With the final tennis major of the year taking place in four days time, Andy Murray had an ideal lead-in for the US Open by winning the Cincinnati Masters last weekend. The last time he won in Cincinnati, he reached the final at Flushing Meadows. But what is more encouraging is that he defeated World No. 1, Novak Djokovic to walk off with what is one of the most unusual trophies I've ever seen in sport (look at the picture at the top of this post to see what I mean). In an era that contains both Rafael Nadal and Roger Federer, many have overlooked the fact that in 2011, Djokovic has been the man. This has been his year, and then some. After last year's US Open, I wrote about how Djokovic had shown discernible signs of maturity after losing in the final to Nadal. Leading Serbia to win their first ever Davis Cup at the tail-end of the season was a springboard to usurp the Spaniard at the top of the men's game. He won the first Grand Slam of the year at the Australian Open, battering & bullying Murray into submission, and hasn't looked back. He went on one of the most astonishing unbeaten streaks in the history of the sport. He won his next 43 matches in succession, a record that was only one match short of Ivan Lendl's 44 match streak in 1981/82 and three short of Guillermo Vilas's 46 matches in 1977. From November 2010 to June 2011, Djokovic did not lose a single match. As children, many future tennis players practice by repeatedly hitting a tennis ball against a wall. The repetition of this exercise aids concentration and technique. However, you never want to hit the ball too hard when doing this, as the harder you hit a ball off a wall, the faster it will come back to you. Well, playing Djokovic is like playing against a wall. No matter how well you're playing, no matter what type of shot you hit, be it power, slice or spin, when you're up against Nole, that ball keeps on coming back. While Federer and Nadal have been at the top of the tree in men's tennis for the better part of a decade, if you were constructing a tennis player, he'd be like Djokovic. The Serb ticks every box; speed, endurance, athleticism, shot power and accuracy, and in the past year, he's added the intangible but pivotal qualities of belief, and a winning mentality to his armoury. The way he defeated Nadal in this year's Wimbledon final showed how the balance of power in the game has shifted towards Djokovic. At the time of writing his win/loss record is 57/2. However, his achievements this year have been something of a double-edged sword. While the high standard of Nole's physical conditioning is without question, he has already played more matches than most players have in a season. He has repeatedly played less than 100% fit, but kept playing because he kept winning. He joked that he wouldn't mind losing a few matches to give him a chance to rest his ailing limbs. Well last Sunday, the decision was made for him. He walked into the final against Murray with an injured shoulder, and Britain's No. 1 took full advantage, taking the first set 6-4, and taking Djokovic's game apart in the process. By the time Murray was 3-0 up in the second set, Djokovic made the pragmatic call to retire hurt. While it would have affronted his professional pride, it would have been folly to exacerbate an injury in a match that was as good as lost, especially with the US Open fast approaching. There are bigger, and more important battles to be fought. Murray knows this as much as anyone. 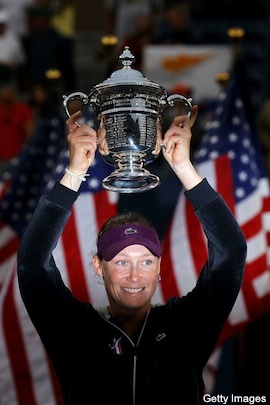 Winning Masters series events are nice, but tennis is all about the four Grand Slams. Any pundit worth their salt knows that Murray has the game to win in New York - indeed John McEnroe predicted at the start of 2010 that this year's US Open would be when Murray breaks his Grand Slam duck. There's no doubt that he likes the environs of Flushing Meadows, winning the boys' title as a 17 year old, and reaching the men's final back in 2008. Murray's game is best suited to hard courts, and while he will not be favourite to triumph next week, everyone knows that he is a genuine contender to lift the title in a little over two weeks time. As for Djokovic, he remains to man to beat, but the first cracks have shown in a wall that had looked hitherto indestructible. There's no doubt that the exertions of this year are taking their toll, and how he fares will be dependent on him holding the foundations together for just a little longer. Simply the greatest tennis match of all time. It may have only been three years ago, but Roger Federer and Rafael Nadal put on an exhibition of tennis that will last as long as sport is documented. I was at Tynecastle to watch Heart of Midlothian take on the might of Tottenham Hotspur, it was laughably billed as the "Battle of Britain", but what it brought into stark contrast was the difference in quality between the English Premier League and the Scottish Premier League. By their relative ambitions, these sides are of equal standing. They're not the best teams in their league but have aspirations to go further, and for the last few years have been best of the rest after the two or three clubs that always win their respective leagues. As a Hearts fan I have no doubts that we are not brilliant, we are barely better than the rest of the clubs outside the Auld Firm in Scotland. We'll have a fight on our hands just to secure 3rd place, but the winner of that position will be the team that makes the fewest mistakes and Hearts have a good enough squad to achieve that. We came into the match as underdogs, but the eternal optimist in me thought if Spurs were have a bad night, we might be able to nick a draw, get them worried, and sneak a freak result in London (I must be allowed these wild fantasies at times). However, what happened was that a national television audience witnessed the gulf in class between English and Scottish Football. Hearts actually played quite well over the whole night. But the fitness (or lack of it) of the players cost Hearts dear in the first half. However, for the first 15 minutes of the second half, we dominated Spurs, creating chances. By this point, Tottenham were already 3-0 up and cruising, but we showed we were capable of causing them problems. There's no denying that Spurs were sublime on the night, they controlled the game, winning 5-0. To be honest, it could have been 10-0 and we would have had no complaints. They sliced our defence open at will, and gave goalkeeper Marion Kello no chance with all five goals that were expertly taken from a group of players that would get bored by the lacklustre standard of the SPL. Their collective first touch, passing, and finishing was of a level that I have never seen at Tynecastle, even from the George Burley team that topped the SPL table in the early stages of the 2005/06 season. Even Barcelona coming to Scotland to play a pre-season friendly at Murrayfield was not comparable to the level of skill on show yesterday evening. I don't think Spurs showed a level of skill that will win the Premier League title, but they showed enough to suggest they can go far in the Europa League, as well as challenging for the Champions League places again this year. Hearts were shown how to play the game, and if they play against the rest of the SPL as they did for those fifteen second-half minutes, they'll cruise to 3rd, and may be in a position to challenge Rangers and Celtic. All in all, it was a privilege to watch Spurs demolish the team I love and I was proud of the support at the end, standing defiant knowing that the better team won. In spite of the result, we were still singing and asking what they would do when we win 6-0 in London. Realistically I know that the tie is dead, but I hope that the players enjoy the experience of playing in London next week. When Spurs bring out their under 19 team in the second-leg next Thursday, I just hope we can match them. This is a weird time to be a supporter of the England cricket team. For as long as I've watched the sport, English cricket has been little more than a punchline. Summer after summer brought mediocrity, annoyance and often defeat. While things began to improve at the turn of the millennium - never more so than the epic 2005 Ashes series - English cricket had a place; which tended to be looking up at the Australians, as they conquered all and sundry to underline their position as the world's best. On the Sunday evening of the first Premier League weekend, the verdict from fans & the media was pretty unanimous; meh. No home wins, only 14 goals in 8 matches, with one game cancelled due to the UK riots earlier in the week, it was hardly an affirmation of the Premier League being the so-called, "best league in the world". All we had left to complete the first round of fixtures was Manchester City vs Swansea; relegation fodder against one of the division's most prosaic sides (albeit title contenders). It looked set to round off a thoroughly lukewarm start to the season. Obviously no-one told Sergio "Kun" Aguero. Prognostication is always a thankless task where sport is concerned. More often that not you're setting yourself up for a fall. Check my prediction for last season's Premier League table if you don't believe me. So first, a disclaimer. My prediction for the upcoming season are based mainly on the current personnel at the 20 Premier League clubs. However, there are still three weeks of the transfer window remaining, and certain players arriving at clubs, or leaving them, could completely change the potential picture of English football's top division. So, tentatively... here's how I expect the league table to look come May 13th 2012. After a gargantuan disintegration - even by their standards - at the end of last season, Arsenal have problems. By the time you read this Cesc Fabregas should be a Barcelona player, and Samir Nasri is also expected to leave Arsenal before September. There is still plenty of talent at The Emirates, and reinforcements are expected to arrive. But at the time of writing, this squad looks fragile, and has been unable to cope when key players are absent with injury. Robin Van Persie proved his goalscoring potency last season, but can he play more than 30 games? And there is a gloomy atmosphere around the club which looks to be self-defeating. Liverpool were in a similar position this time last season, and it killed their chances of success. Arsenal look set to repeat this. They haven't been helped by some difficult games to start their campaign, exacerbated by a tough Champions League qualifier against Udinese. Losing that match, and making a bad start domestically, will be disastrous. Another hurdle is the African Cup of Nations that takes place in January, meaning that they will be without Alex Song & Gervinho for about a month. This could be a season of ignominy & frustration in the red half of North London. Key Player: Robin Van Persie - With Fabregas & Nasri set to leave, Van Persie is one of the few men of character left at the club. If he stays fit, he'll score 20+ goals, and could get Arsenal into the top 4. The problem is that he's been at the club for seven seasons and has failed to stay fit for the duration of any of them. Last season was a real mixed bag for Villa. Towards the end of the campaign, they looked to have the makings of a dangerous side, with Darren Bent, Ashley Young & Stewart Downing looking like one of English football's best front threes. However, Young & Downing have moved on, and you get the feeling that Villa are starting from scratch again. Alex McLiesh is a solid appointment as manager, but he has a job winning over the fans & tends to produce teams that play quite prosaic football. If key names come to the fore, then Villa should be safe, and will also be a potential threat in the cups. But if not, it could be a nervy season for the Second City's biggest club. Key Player: Darren Bent - With Downing & Young gone, he'll find goals harder to come by. But he seems to able to score wherever he is. And he'll need to find the net often enough to keep Villa away from the threat of relegation. A tough season awaits Blackburn. Once Premier League champions, Blackburn look a rudderless ship. The sacking of Sam Allardyce - which still seems nonsensical - sent the club from a mid-table team into one spiralling down the table, only staying up on the season's final day. Ignore pundits who make juvenile & reductive jibes about how the club's owners have made their fortune, especially as there are so many genuine criticisms to make about them. Manager Steve Kean still looks like a novice, and the spirit at the club - once one of their greatest strengths - seems to be emaciated. Worst of all, there seems to be no kind of footballing philosophy, no specific plan of how the team should play. Blackburn look like a ship that's hit an iceberg. Key Player: Paul Robinson - With Christopher Samba likely to leave, Robinson will be one of the Premier League's busiest goalkeepers. He had one of his best seasons for years last time around, and we'll need to do so again. Blackburn's top flight survival will probably depend on it. What looked to be a good season came off the rails after getting a beating from Stoke in the FA Cup semi-final. Also, the financial state of the club is fragile. Johan Elmander has gone, and Gary Cahill could soon join him in departing the Reebok Stadium. Added to this, Bolton's pre-season preparations were badly disrupted by not only Tyrone Mears, but star wide-man Choung-Yung Lee both suffering broken legs. But it's not all doom & gloom. Owen Coyle may have walked under some ladders over the past few weeks, but he remains one of the best managerial talents in Britain. His ability to maximise his resources should be able to keep the Trotters heads above water. Key Player: Kevin Davies - The captain is the heart of his team. 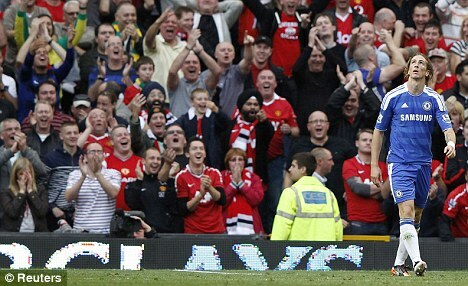 He showed that he has class & well as brawn, and will be needed as a talisman, on & off the pitch. He won't be a massive source of goals, but Davies gives Bolton an intangible spirit that could be the difference between being relegation fodder & ending in mid-table. A tough one to call. They had a spell during last season when their level of performance was embarrassing. Roman Abramovich's stewardship of the club has been beneficial in some respects, but he has a capricious nature which often makes the manager's job more difficult than it has to be. New man Andre Villas-Boas has a stellar reputation, but has been thrown into the deep end. He has an increasingly aging squad, and they look short of devil in their midfield. Anything but instant success will not be accepted by Abramovich. Journalist Martin Lipton has said that the only reason to manage Chelsea is for the lucrative pay-off upon being sacked. For Villas-Boas's sake, let's hope he can find a way to avoid the sharp axe of the Russian oligarch. Key Player: Fernando Torres - It saddens me that we have probably seen the best days of the Spaniard, as in full flight he is a wondrous player. But orders from high have decreed that Torres is to be the key attacker in this team. And as such, any potential success for Chelsea depends on Torres regaining his form circa 2008. Many Everton fans are as restless as their counterparts at Arsenal, railing against the lack of investment in the squad. However, unlike the North Londoners, Everton simply don't have the funds to improve a hardworking, but limited group of players. David Moyes has no choice to work with what he has, which is good enough to finish in the top half, but has too many deficiencies to make the top six. With lack of goals a constant problem, Everton's only real chance of glory this season is in the cup competitions. Key Player: Tim Cahill - Maybe the league's most underrated player. Similar to Kevin Davies at Bolton, Cahill is not a regular goalscorer, but his ability to score at crucial times has proven invaluable. Like his manager, you wonder how long he can continue to pull up trees. Once again, Everton will rely heavily on the Australian. It seemed that Mark Hughes thought Fulham was beneath him after resigning in the summer. Well, he remains unemployed while Martin Jol has taken over the reins. Fulham had an early start to the season in the Europa League qualifiers, and while they're unlikely to repeat their exploits of two seasons ago, no side would look forward to facing them. Similar to West London neighbours Chelsea, Fulham have a reliable but aging spine. Jol will have to juggle his resources wisely to keep the club away from relegation trouble. If he can do that, and improve the side's appalling away form, it'll be another season of prosperity at Craven Cottage. Key Player: Bobby Zamora - Was badly missed last season after breaking his leg. Had he been fit, Fulham could easily have finished in the top seven. Now he's back, Fulham have a potent goal threat again. With Emile Heskey having seen better days, he's arguably the division's best target man. With Kenny Dalglish in charge, and a raft of new - if overpriced - players arriving, optimism is rife at Anfield. Some of this optimism is misplaced, as the odd fan thinks that Liverpool can win the title. That will not happen, but I'd expect them to improve on last season's finish of 6th. They have the personnel to do some real damage in the FA or Carling Cup, especially if Luis Suarez can strike up a good understanding with Andy Carroll. The main worry is the defence. Jamie Carragher has been on the slide for two years, while Daniel Agger is a class act, but injury prone. Whoever defends better between Liverpool or Arsenal over the course of the season should get the coveted fourth spot in the table. If Liverpool fail to make the Champions League, Dalglish's position could be under threat. He's deified by the fans, but given that the owners firmly have backed him in the transfer market, they expect to see a tangible return on their investment. Key Player: Luis Suarez - The little Uruguayan surprised many by settling into English football with ease. The only sticking point is his participation in helping Uruguay win this summer's Copa America (his performance in the final was magnificent). However, if he can ward off potential fatigue, he is a star in the making. It could be worth putting £10 on him to be Footballer of The Year. The potential inherent in City's financial muscle has begun to be unlocked. The trophy drought is over, they're in the Champions League, and have the strongest squad of players in the division. It's simply a matter of Roberto Mancini making the whole equal to the sum of their parts. All the pieces are in place to make City the country's top side, but money can't buy a winning mentality. And it's mentality that will probably decide which club in Manchester end the season as champions. Key Player: Vincent Kompany - For me, he was the league's best player last season. While City are brimming with attacking options, they look a good centre-half short. This means that Kompany will have a massive workload, both domestically & in Europe. If he can replicate last season's performance, winning the title isn't out of the question. 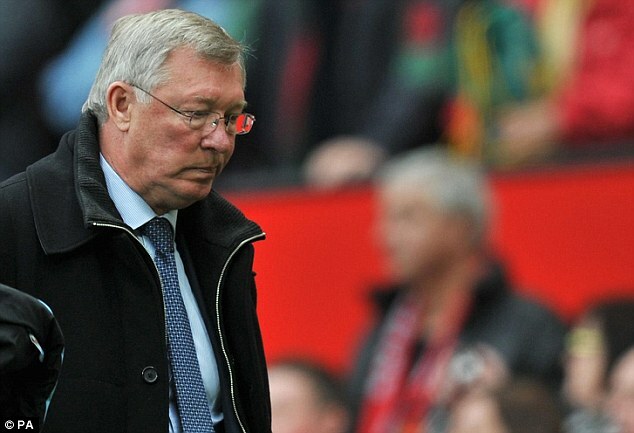 In years to come it'll be forgotten, but Sir Alex Ferguson produced one of his finest seasons last time out. Winning the league with a game to spare, as well as reaching the Champions League final was an excellent achievement. Ferguson has a much stronger squad to work with now, but it still looks short on the midfield solidity & craft needed to reach Europe's summit. But that doesn't mean that they can't remain the kings of England. They have an unremitting hunger for silverware, and have a refreshed Wayne Rooney to lead the attack. You can expect this title race to be a close run thing, but you can also expect United to be favourites. Key Player: Wayne Rooney - His game was in tatters 12 months ago. But he played himself back into form by March, and looks like a greyhound, itching to get out of the traps for this season. Seems settled on the pitch again, which is good news for both England & United, as he remains the lynchpin for both sides. He may not hit the goalscoring heights of two seasons ago, but the safe money for Footballer of The Year would have to go with Rooney. Another club with a potentially mutinous atmosphere. The fans revile the owners, barely tolerate the manager, and the club's better players have been sold. There have been some good signings in Yohan Cabaye & Demba Ba, but the squad looks threadbare, and it's heart seems to have dissipated, with the club making headlines for all the wrong reasons again. If swift improvements are not added, then Newcastle could be heading back to the Championship. Key Player: Yohan Cabaye - Newcastle's recruitment of players is open to much criticism, but could be offset by the arrival of the Frenchman. He was a pivotal part of the Lille side that won the French Championship last season, and in interviews, looks to be more than a highly paid foreign mercenary. If - and it's only if - but if he settles quickly, he could take the Premier League by storm. Manager Paul Lambert has worked wonders in East Anglia, garnering two promotions in as many seasons and getting Norwich back in the top flight for the first time in six seasons. He has shown great organisational skills, as well as getting players to perform above themselves. While some fans may expect Norwich to be embroiled in a relegation fight, as long as they continue to play the enterprising football that has served them so well, I can see Norwich being one of the league's pleasant surprises. Key Player: Grant Holt - Has been the scoring machine that's taken Norwich from League 1 to the promised land. Will need to continue in this vein, as it's tough to see where goals will come from if he fails to adapt to the top division. The flouting of Football League regulations aside, QPR stormed the Championship last season to gain promotion. Inspired by the mercurial Adel Tarrabt, they are back in the Premier League after an absence of 15 years. However, Tarrabt's importance to the team may be a problem, as the tactics are built to get the best out of him. Which means that all opposition teams have to do is to stop the Moroccan, and QPR's attacking threat is nullified. Unless manager Neil Warnock figures out an alternative, QPR may not last long at this level. Key Player: DJ Campbell - His goals came close to keeping Blackpool up last season. He should have no problems settling in, and if he gets enough service, should make some more hay at QPR. He will need quality service however, or he'll be a liability on the pitch. There are many ways in which Stoke are a throwback to a previous era of the game. The most positive one being how they spend within their means, make the best of what they have, working on steady improvement rather than reckless spending. It's not that Stoke aren't reaching for the stars, but they know it can take a while to get there. European football will be a new test, and they look a striker light, but they remain a team that no side looks forward to playing. Key Player: Ryan Shawcross - His enthusiasm is energising to his teammates, and sometimes dangerous for opponents. But Stoke's defence is the key aspect of their side, and Shawcross is the leader of said defence. With an increasing amount of fixtures, it'll be tested like never before. A talented but flaky group of players were maddeningly inconsistent last season. But the signs indicate that Steve Bruce has learnt from his previous mistakes, going all the way to how he monitors the physical conditioning of the players. And they've worked the transfer market well; Craig Garder, Seb Larsson, and the ex-Man Utd pair of Wes Brown & John O'Shea are strong additions which should add a thicker resilience to the side. Sunderland should be a much tougher nut to crack this season. Key Player: Craig Gardner - Last season was a breakthrough one for the Brummie. He shone in a dismal Birmingham side, and should be allowed to drive forward from midfield in Wearside now. His goal threat will take a lot off of the pressure of Asamoah Gyan. Wales's first contribution to the Premier League is a welcome one. Particularly for a side as aesthetically pleasing as Swansea. But they are without last season's top scorer, Fabio Borini, and their defence looks well short of the resilience needed at this level. Unless Brendan Rogers works the transfer market cleverly, Swansea may find the rarefied air of the Premier League too thin for them. Key Player: Scott Sinclair - Has the talent to be a star at this level. But has he the temperament? Rodgers will give Sinclair full licence to unlock defences, and given that Swansea are unlikely to play defensively, they will have to make the most of their attacking threat. Which means that Sinclair must realise his potential this season. With the fun & frolics of last season over, reality has hit for Spurs. They have no Champions League to look forward to, Luka Modric wants to leave, and many expect this to be Harry Redknapp's last campaign in charge. Tottenham still have a good squad of players, but the character of some of them is questionable, particularly their strikers. If one of Jermain Defoe, Peter Crouch or Roman Pavlyuchenko can find the net regularly, then a top four place is achievable. You just wonder how badly some of these players want to succeed for Spurs, or do they just see the club as a stepping stone to bigger things? Key Player: Jermain Defoe - Picked up an injury playing for England, and was dreadful upon his return. But he is the most natural goalscorer at the club, and if he can shake off the flakiness that has stunted his career, Spurs will have the end product that cost them dear last season. What did I say about nice guys finishing last this time last year? Sometimes it feels really good to be wrong. A responsibly run club, coached by a likable & competent manager, playing expansive football with a warm & unassuming fanbase. How lovely English football would be if more clubs were like West Brom. Similar to Stoke, expect incremental improvement rather than rapid progression. Key Player: Peter Odemwingie - The best value signing of the last campaign. As long as he doesn't allow his exploits of last season to go to his head, then expect his cult status at The Hawthorns to grow. I don't know how they're still in the Premier League, but they are. And yet again, Wigan are having to fight a losing battle to stay afloat. Key player Charles N'Zogbia has departed for Aston Villa. Their defence remains porous, and they look blunt in attack. A lot of pressure will be on the skill of their midfield. Sooner or later, Wigan will be relegated, I just don't think it'll be this season. But I wouldn't put any money on that. Key Player: Hugo Rodallega - James McCarthy aside, the last class player still remaining at the club. Scored the goal that kept them up last season. If Wigan are to beat the drop zone again, expect Rodallega to play a significant part. They're lucky to still be in this division, but I'm glad that they are. I have a fondness for the club, and their sardonic manager, Mick McCarthy. It looks as if they are making a concerted effort to move away from the roughhouse football that blighted the team at times. And Roger Johnson & Jamie O'Hara are two fine additions to the squad. Wolves should be good enough to avoid the drop zone this time. Key Player: Jamie O'Hara - Has impressed me ever since he made his debut in the North London derby as a teenager. It looks as if he'll get a long overdue shot at being the midfield general at this level. Has technical competence allied with strong tenacity, and should be a proficient link between Wolves's midfield and attack. In what has been a long overdue episode, we induct Nadia Comaneci in our Legends Hall Of Fame. The Romanian left an indelible mark on sport in the 1976 Olympics, becoming the first person to achieve seven perfect 10's in the history of the gymnastics competition. There are many great sports stars, but only one was perfect. Last year, Formula 1 started their season with what looked to be the most open championship race in history. With as many as six men being tipped for the title, anticipation for the sport was at its height. And it proved to be a thrilling title chase, with three men in with a chance to be World Champion in the season's final race. In the end it was Red Bull's Sebastian Vettel who grasped his opportunity to become Formula 1's youngest ever World Champion. The 2011 season however, has been more of a closed shop. With Vettel being the shop's sole proprietor. For most of the first half of this season, Vettel has made the most of a car that is even better than last year's model to open up an almost unassailable lead at the top of the drivers championship. The inconsistent displays of his teammate, Mark Webber have mattered little as Vettel's dominance means that Red Bull already have one hand on the constructors championship for another season. Team principal Christian Horner runs a tight ship, and has his mechanics motivated to get the very best out of Vettel's car. And in Adrian Newey, Horner probably has the most accomplished technician in the pit lane right now. However, Vettel has shown signs of vulnerability in recent races. The plan for this season has been to get the German on pole position, and then ensure he gets off the starting line quickly, giving Red Bull total leverage to control the outcome of the race. But there has been a steady improvement from the McLarens of Jenson Button & Lewis Hamilton. And the closing stages of the British Grand Prix showed that Webber refuses to play lackey to Vettel, regardless of what Horner says. If he can get his act together after the mid-season break, he could make things awkward for his teammate. Sadly, for neutrals, making things awkward for the current World Champion is the best that can be hoped for. Hamilton & Button have pulled up tress over the past month, doing their best to disrupt the Red Bull procession to the title. They have shown great opportunism in unfavourable weather conditions to give Vettel a bloody nose in the past couple of Grand Prix's. This season Vettel has proved that there is no better front-runner in Formula 1 right now. But when he has to scrap & scramble his way to victory he can be found wanting, and his inability to dominate when the rain falls is worrying for a guy who's ostensibly the best in the business. All the sport's great names tend to shine when the track gets damp, but the opposite seems to be the case with Vettel. However, his points lead is so gargantuan that it would take one of sport's greatest acts of choking for him to fail to retain his world title. However, just as Formula 1 was looking to have as much unpredictability as a Kate Hudson comedy (the term "Kate Hudson comedy" may be an oxymoron), the likes of Button, Hamilton, Webber & Fernando Alonso have shown that they intend to make the German's path to the championship as arduous as possible. It looks as if Formula 1 may be worth watching again when it returns from its break in 3 weeks.